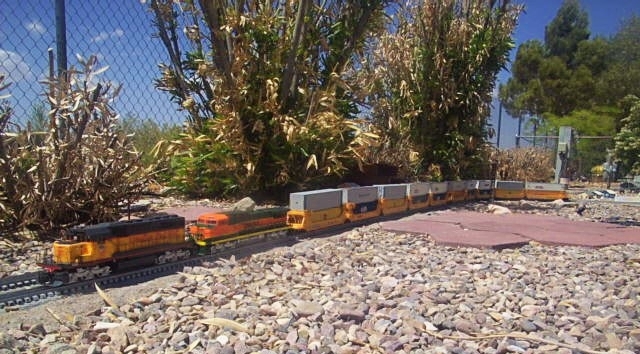 This collection of photos and tips started as an answer to an e-mail from Paul Race, who feels that O Gauge Outsiders could benefit from more examples and resources. 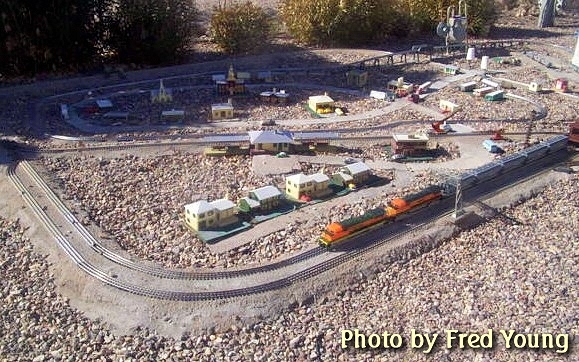 He has been publishing all of the information on O Gauge Outside railroads he can get his hands on. For myself, I live in Tucson, Arizona and I have been operating the Copper Valley Railroad in my back yard since 2000. I had no resource material so what I know has been learned through trial and error. 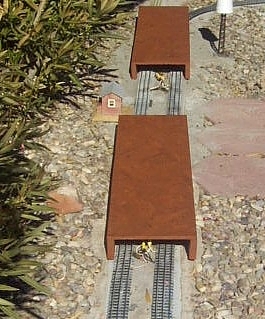 Up front let me tell you that outdoor O gauge is not only feasible but it has lots more possibilities than being confined to a table indoors. Still, I did have to make some adjustments. I use Gargraves Stainless steel track with plastic ties. At first I tried Gargraves with wooden ties, but you wouldn't believe what the bugs here can do to it overnight, even if it's treated. I replaced it with the track with black plastic (supposedly UV-resistant) ties. But the black plastic ties warp quickly under the bright summer Arizona sun, making the track go out of gauge, among other problems. I found that painting the ties with aluminum paint solved that problem; the aluminum paint reflected the sun and eliminated the warping. I talked to Gargraves about the problem and they agreed to run some track with light gray ties to simulate concrete ties that are now used on some Eastern Railroads. I have had no warping problems with the gray tie track. The majority of my track is now the type with the gray ties although the silver-painted black ties are doing just as well. I also found remote turnouts to be too temperamental. I have had no major problems since I installed manual turnouts throughout the railroad. Mike Church suggested a design for switch covers that has worked very well for me. Unlike the railroads built by the Blessings and the Canfields, my railroad is on the ground. I wanted to bury the power wires to protect them from UV rays especially in the summer. 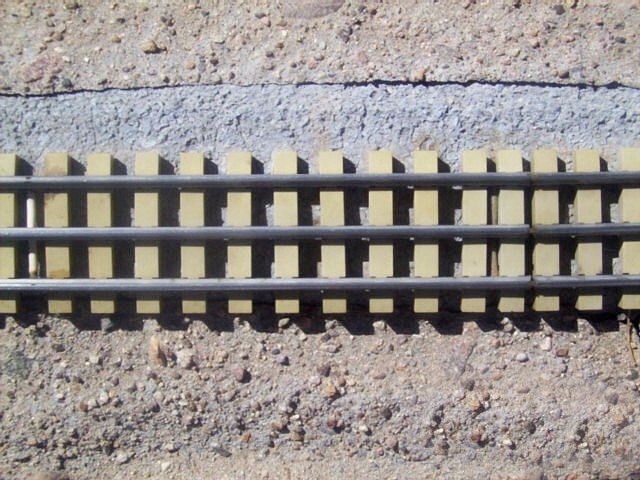 Having the track on the ground allows me to use a concrete roadbed solution that protects the track from warping or going out of gauge. It doesn't take any special talent to lay track on the ground and it provides realism to have the track bed follow the contour of the ground. Some folks who know the kind of "flash flooding" we can get here wonder if flooding is a problem. The truth is that in periods of very heavy rain I HAVE seen the entire railroad under water for brief periods and it hasn't suffered any ill effects. The only advantage that I can see in elevating the roadbed here in Arizona would be to bring it up closer to the operator and thus eliminate kneeling. If I were to try this in the Midwest, though, I might consider at least a slight elevation above ground level to provide a firm roadbed and to stay out of the grass. After various trials and errors, I have figured a method for ground-level installation that stabilizes the track and eliminate any possible gauge change. Using gravel and dry concrete liberally, create a level right of way. Cover the track with a dry mixture of four parts sand to one part Portland cement. Use an old paintbrush to smooth the mixture and work it into the spaces between the ties. Use a sprinkling can to water the dry concrete mixture. 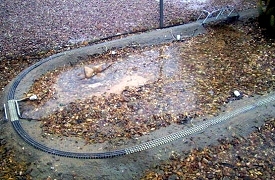 I like to go back and apply water about three times within an hour to assure complete wetting of the mixture. When it dries it looks like the second picture of the track. When properly installed, this concrete base holds the ties and eliminates any possibility of them warping, even in the hottest sun. I have buried a power cable under or along side my entire track. I needed a twin cable that would stand up outdoors and I found that the cable used for outdoor low voltage lighting met my needs very well. I have connected power to my track every ten feet over the entire layout to insure both adequate power and adequate TMCC signal for the locomotives. It is imperative to have every connection the same polarity, and the low voltage wire makes it easy to accomplish this since one of the wire covers is smooth and the other one is ribbed. 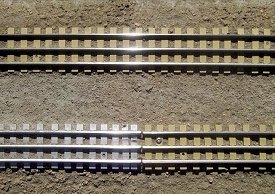 In my layout ribbed is hot or middle rail and smooth is ground or outside rails. The tank cars and hopper cars that I leave outdoors on sidings are painted silver to prevent warping or deterioration. Other cars, such as grain cars get silver roofs. In Arizona, if you are don't want a silver roof on the car then get it into the shade when you are done running. 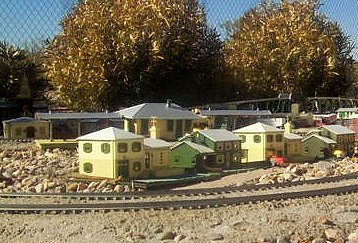 By the same token plastic buildings with white or silver roofs hold up very well in the sun. Wooden buildings don't work. I paint the walls with spray paint purchased at the hardware store or Wal-Mart or Lowe's or Home Depot. In other words, almost any paint will do for the WALLS. I found the secret to preserving plastic buildings is the use either white or aluminum paint on the ROOF. The bright roof reflects the sunlight and prevents warping or deterioration. Before I took my trains outside, I asked Lionel if I would be able to use their TrainMaster Command Control system outside. They said no. That was all the challenge I needed. Today I operate the whole railroad (except for the turnouts) with TMCC. It is not only possible but it certainly isn't any more complicated than an indoor layout and it is much more realistic. Again, I start with vinyl bed between the track and the roadbed to insulate the track from the ground for better TMCC signal strength. 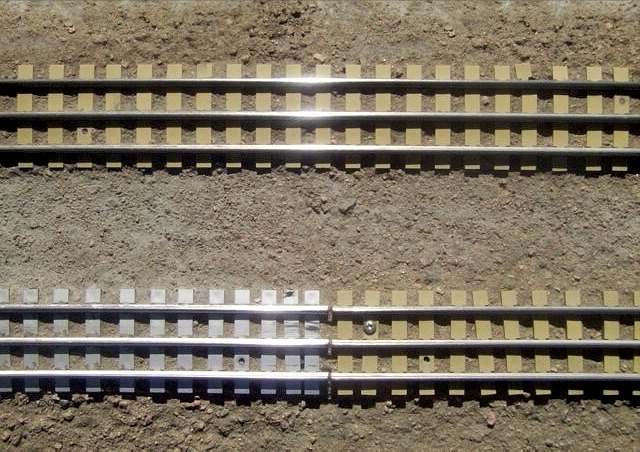 When using track with plastic ties, one needs to solder a jumper wire between the two outside rails at regular intervals to assure that the TMCC signal is being "broadcast" from both of the outside rails. All of the power sources and the TMCC controller are located in my shop adjacent to the railroad. The CAB-1 will address the controller in the shop at a distance of 75 feet with no problem. I do not presently use TMCC for turnout control. In my original construction I used TMCC for all of the turnouts and it worked marginally O.K. for the first season. If a little dirt gets into the turnout mechanism, it causes derailments because the switch hasn't locked properly and the operator doesn't know it because they aren't there to observe the switch. Switch motors do not survive the outdoors well. Many turnouts are constructed of some type of plastic to represent realism but anything other than silver colored objects soon warp in the sun. But there is an even more compelling reason for using manual turnouts in an outdoor layout. The reason we use remote switches in complicated indoor layouts is because we can't reach many of the switches with our hands. That isn't true with outdoor layouts. One of the great things about outdoor layouts is that the operator can walk all around the layout and observe train operation from wherever they want. It follows that the operator can walk to any switch in the layout and "throw" the switch just as the brakemen and conductors do in real life. Manual turnouts actually add realism to the operation of your railroad empire. I don't have to build scenery; I already have it. However, the most difficult transition is re-programming one's brain to think outdoors and leave your indoor knowledge indoors. Instead of inspecting the track for obstructions like loose screws or dust I check for scorpions and rattlesnakes and roadrunners. Rattlesnakes can get very grouchy when they are sunning on the track and you turn on 18 volts. It is not unusual for them to lie in the shade of a tunnel on a hot day. Another difference is whether you do the weathering or let Mother Nature do it. Note the weathered look of the track in the train-shed photo. Indoor people spend a lot of time ?weathering? 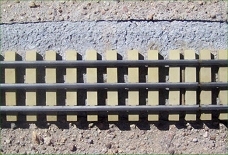 tracks and rolling stock; weathering is a free bonus with outdoor O gauge. Since my railroad runs all year, I don't do any typical seasonal work. In the spring I do need to check my long tunnel before running for any rabbits of rattlesnakes that may be residing there. You either have one or the other but never both. I usually park trains in the tunnel to protect them from the sun and rabbits can derail cars as they move past them. Snakes usually don't derail cars but they do get very testy if you turn on 18 volts wile they are laying on a section of track. It doesn't harm them but they do seem to get out of sorts and an upset rattlesnake is not your best friend. My solution is to turn on the power and then just wait a few minutes while the snake or snakes sort things out. A good thing is that snakes will not cross the tracks while the power is on. Another good deterrent for the snakes is to have a Roadrunner living close by. Roadrunners will soon be nesting and snakes are one of their favorite foods both for themselves and the kids. Attached is a photo taken here on the Copper Valley railroad that I thought you might find interesting. 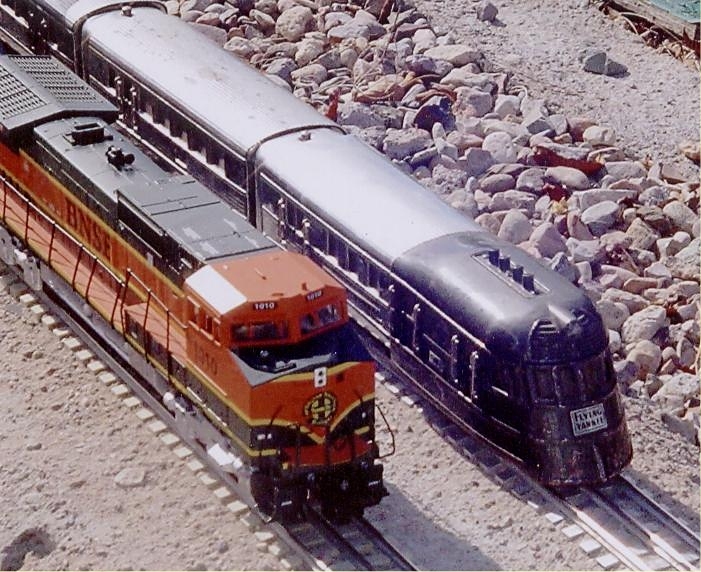 The Yankee Flyer pictured here next to the Dash-9 is a Lionel model produced in 1937. A friend of mine in Phoenix dug this out of a closet; he received it new in 1937 as a Christmas gift. I installed a new impeller on the whistle and replace some old wiring on the motor and it runs like new. I thought the contrast of the two Lionel locomotives from different eras was interesting. We are moving into our summer season here in Tucson and we will soon be seeing the triple digits on the thermometer. Freight traffic continues to increase on the Copper Valley Railroad in spite of the slowing economy and we have also seen a nice increase in passenger traffic on the Super Chief. Folks in the Midwest should be getting their outdoor railroads in operation and I hope you all have a great summer. Greetings from Tucson where fall is in the air and our daytime temperatures are now below 100 degrees. 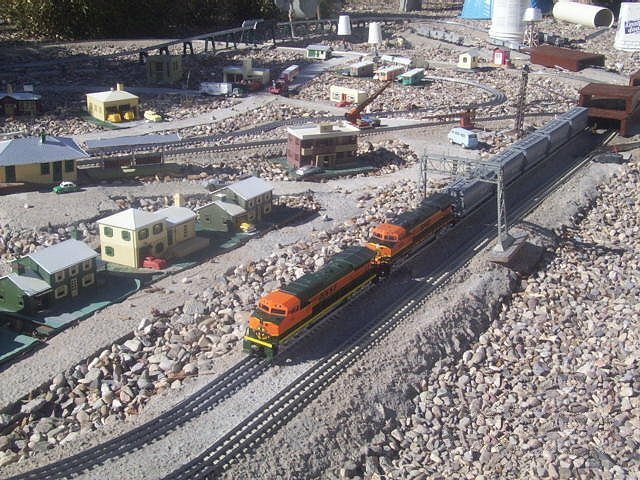 Unlike northern outdoor model railroaders, we really look forward to the fall, winter and spring months to get out and get the freight moving. During the summer months I work very early in the morning and late in the evening. 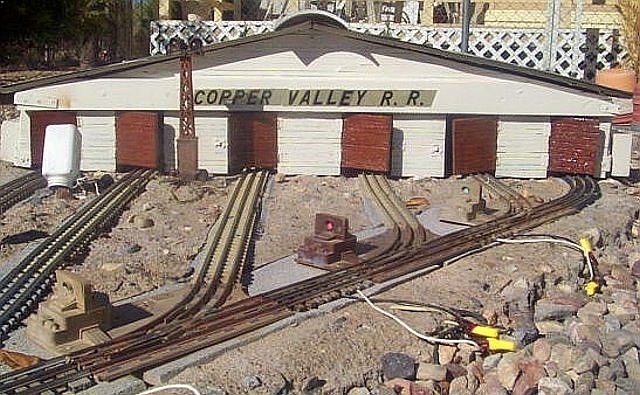 I continue to experiment with new ways of improving the operation of the "O" Gauge Copper Valley Railroad here in my back yard and this summer I made a breakthrough in more uniform power distribution over the entire railroad. I am currently using four transformers to power my railroad with a combined power of 660 watts. I now have something over 300 feet of track with several accessories and I like to operate multiple trains at the same time with my TMCC controllers. I believe that with the typical, flat, indoor layout this setup would provide sufficient power. 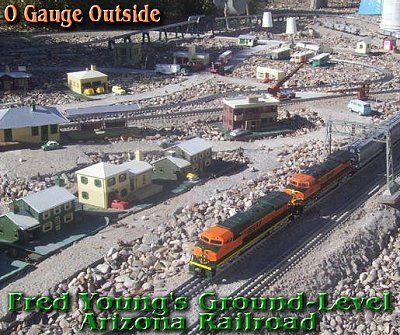 My outdoor layout follows the contour of the ground just as real railroads do and at the far reaches of my layout there is "mountainous" terrain that involves 2% grades. I have buried #14 wire under the layout with contacts soldered to the rail every ten feet. Still, I have always found that hauling heavy loads on the 2% grades through the mountains has been a challenge for even the best "pullers". Voltage measurements closest to the transformers show a reading of 18 to 18.3 volts. At the far end of the layout I had readings of 17.3 volts. While the actual voltage loss seems small, it does represent a power loss of about 5% on average. This 5% power loss does make a difference when pulling maximum loads on a 2% grade. In an effort to obtain a more uniform power distribution, I tried locating one of the transformers in the far reaches of the layout and wiring it into the track at that point. So far I am very pleased with the results. I have a voltage of no less than 18 volts everywhere on the layout and the performance of the locomotives in the mountain area is now as good as it is on the flat sections. It is imperative to have the polarity correct when attaching the remote transformer [put the correct wire on the correct rail] and it is important to power up that transformer after the main power source and the TMCC control is turned on. While my "O" gauge layout operates with AC current, I thought that power loss could also be a problem for DC operators and, if so, relocating a transformer might help. This solution would only be useful to operators who use TMCC or DCS control. P.S. I place a white bucket over the transformer when I am not running trains. The bucket keeps the occasional raindrops off of the transformer and the white color reflects the sun and keeps the transformer cooler.